The research was well worth it, as BNA has reduced its greenhouse gas emissions associated with shuttle operations while maintaining the same hourly cost for labor, operation and maintenance. The game-changer was a fleet of 28 new buses that run on compressed natural gas (CNG) and a $1.9 million facility to fuel them. Christine Vitt, vice president of Strategic Planning and Sustainability for the airport authority, is extremely pleased with the results of the new system’s first year in operation. The project team was hoping to lower bus operating costs to $1.79 per gasoline gallon equivalent, but instead achieved $1.62. The decision also led to formal recognition from the Tennessee Department of Environment and Conservation. The airport authority received a 2017 Governor’s Environmental Stewardship Award for its ongoing commitment to sustainability, including its recent deployment of CNG vehicles. The airport authority had already decided to convert its entire shuttle fleet and build a fueling facility, but needed help figuring out fueling specifics, vehicle maintenance logistics and other details, she explains. Schugar-Martin, who previously worked as a corporate attorney on environmental projects, encourages other airports thinking about a switch to consider several factors. First, what is the alternative fuel source going to be? 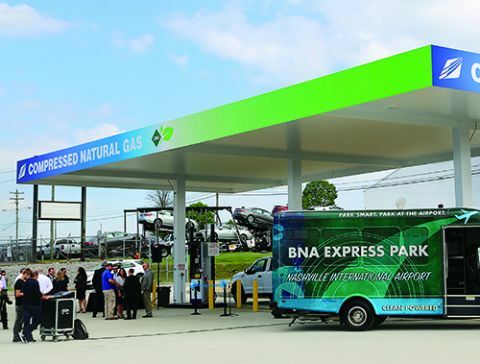 BNA had already selected CNG, but her firm helps other clients decide based on the environment vehicles will travel in, what fuels are locally available or routable, and, of course, cost. “Not all airports may have access to natural gas,” she explains, noting that BNA was fortunate to be very close to a main CNG line of Piedmont Natural Gas. As importantly, the size and pressure of the nearby gas line was able to support the facility, adds Vitt. Finally, she recommends considering the logistics involved with storing and maintaining alternative fuel vehicles. Does the existing maintenance building meet specific codes for housing or repairing CNG shuttles? (BNA needed to renovate its facility.) Does the exhaust system in the maintenance facility need to be upgraded? Who will train vehicle mechanics? How will equipment be implemented? “As you see, the process can be very complex,” she says, noting that these are just a few examples of issues that need to be explored. Vitt says she was glad to have Schugar-Martin as a project consultant, but the airport authority also needed a company to design, build, operate and maintain the fueling facility. Ultimately, it awarded a seven-year operation/maintenance contract with three one-year extensions to Clean Energy Fuels. J. Russell Wharton, the company’s senior project manager, explains that the project also included designated duty engineer requirements, so his team got involved in coordinating construction work and selecting the general contractor. Because Wharton lives just south of Nashville and had more than 20 years’ experience with local codes and permitting requirements, he personally led the permitting, engineering and construction components of the project. Permitting was a particular challenge that took four months rather than the six to eight weeks as anticipated. “Nashville is a rapidly growing city, so we had some permitting challenges because we were one of very many construction projects going through the review and approval process,” Wharton explains. Despite unavoidable bureaucratic delays, Clean Energy kept the construction schedule moving by “finding ways to stick a square peg into a round hole,” says Schugar-Martin. “They really have the expertise to address some of the specific challenges for alternative fuel projects. Given the teamwork, BNA’s new fueling station opened in April 2017. The new buses, however, were delivered in November 2016, and up and running during the first week of January 2017. In the months between, the shuttles fueled up at a nearby station. Schugar-Martin counsels clients to develop relationships with other local CNG sources so they can continue to operate 24/7 even if challenges arise. Doug Dunn, chairman and chief executive officer of Alliance Bus Group, notes that the airport authority was involved in every part of the vehicle specification and design process, so the CNG-fueled buses were built specifically for BNA. They have no steps, are compliant with the Americans With Disabilities Act and include television monitors for updated news feeds, as well as security camera systems. Maintenance crews from fleet owner/operator ABM Aviation also like the new vehicles, because they don’t include exhaust filters that require frequent changing. Wharton notes that the airport had a clear vision for its CNG station and wanted multiple options for future expandability. The facility’s location was key, adds Vitt. The new station is next to the bus maintenance facility and just across the street from the airport’s consolidated maintenance building. It’s near the terminal and parking facilities, but could also provide public access if BNA ever goes that route. Currently, the station only fuels airport vehicles. The airport installed three CNG compressors, and two are currently in use. The caps are already in the ground, so new dispensers can be dropped in to accommodate more demand, explains Schugar-Martin. The airport was cognizant of the hassles associated with installing expansion pieces later and opted to endure the extra work and expense on the front end. 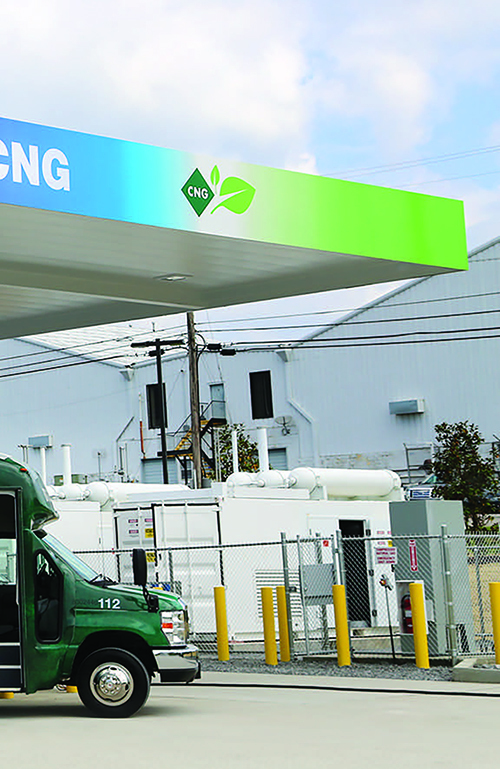 The airport’s new CNG capabilities are already proving useful beyond the passenger buses. The entire maintenance fleet is beginning to transition as well. Last year, two CNG-burning F-150 pickup trucks were added; and this year, two F-250s and another F-150 will be replaced with CNG-capable counterparts. Vitt explains that using CNG vehicles for day-to-day maintenance activities makes sense, given the associated long-term cost and emissions savings.